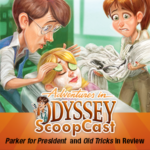 The Odyssey ScoopCast rolls right along with the next review of Adventures in Odyssey Album 61, Without a Hitch! The Odyssey ScoopCast reviews the latest Jones & Parker mystery episode “The Key Suspect” from Adventures in Odyssey Album 61. They discuss the mystery behind the mystery, the return of Dion, and more. Plus, Garrett introduces a brand-new segment: Odyssey Theory.